Do you have some info like date, price or product name which needs to be displayed in a few different places on your WordPress website? When you need to change any of those, it may take some time to find all places where you put that info and update it everywhere. Plus, there is always a chance that you missed a spot or two. 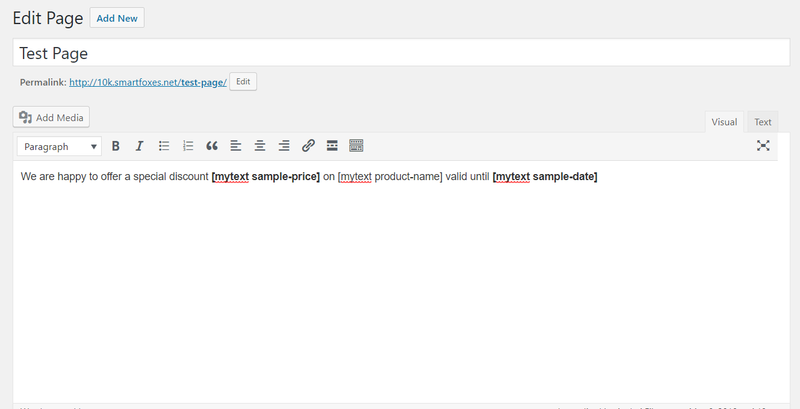 WP Text Expander plugin allows you to replace common pieces of text in your posts, pages, menus, sidebar widgets with a custom shortcode and then update actual text from one central location in WordPress admin. Once you have your terms setup, you can use a simple shortcodein your posts, pages, widgets and even menus. Your shortcodes will be replaced with centrally stored replacements, which makes it super-easy to update all entries from just one central spot, saving your time and making sure you haven’t missed a spot. Free version of this plugin is available from WordPress.org repository, doesn’t include email support.